World AIDS Day works to ensure that those who suffer from AIDS can live in a safer, more understanding world. And help further research to eliminate it. World AIDS Day was first held in 1988, just four years after the discovery of the virus and its official classification. Since that day the work of men and women everywhere has led to a greater understanding of the dreaded disease . There is a disease that reached out into the world and changed the way we thought about everything, from how we got our blood transfusions to our sexual practices. Celebrate today by educating yourself about HIV/AIDS, and then start researching what you can do to help. 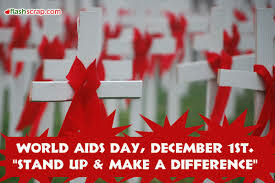 You can also wear a red ribbon to help spread awareness of the disease. It’s important that everyone understand the dangers of it, and just as important that they understand how it’s contracted. Not just as a way to avoid contracting it, but to reduce the fear that surrounds this horrible condition.